Anyone familiar with the meteoric rise of Benjamin Percy's career will surely have noticed a certain shift: After writing two short-story collections and a literary novel, he delivered the werewolf thriller Red Moon and the postapocalyptic epic The Dead Lands. Now, in his first book of nonfiction, Percy challenges the notion that literary and genre fiction are somehow mutually exclusive. The title essay is an ode to the kinds of books that make many readers fall in love with fiction: science fiction, fantasy, mysteries, horror, from J.R.R. Tolkien to Anne Rice, Ursula K. Le Guin to Stephen King. Percy's own academic experience banished many of these writers in the name of what is "literary" and what is "genre." Then he discovered Michael Chabon, Aimee Bender, Cormac McCarthy, Margaret Atwood, and others who employ techniques of genre fiction while remaining literary writers. 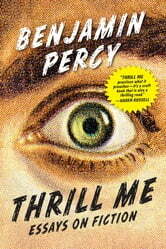 In fifteen essays on the craft of fiction, Percy looks to disparate sources such as Jaws, Blood Meridian, and The Girl with the Dragon Tattoo to discover how contemporary writers engage issues of plot, suspense, momentum, and the speculative, as well as character, setting, and dialogue. An urgent and entertaining missive on craft, Thrill Me brims with Percy's distinctive blend of anecdotes, advice, and close reading, all in the service of one dictum: Thrill the reader. Will My e-Book Look Just Like My Printed Book?